I have written a series of blog posts about Robin W. G. Stephens as he played a pivotal role in the Josef Jakobs story as commandant of Camp 020 interrogation centre. A couple of months ago I had a fascinating email exchange with Nick Hinton, a former commander of the 2nd Gurkha Regiment, and now involved with The Royal Gurkha Rifles Regimental Association (RGRRA). Hinton has been researching the story of Robin W.G. Stephens who, before becoming involved with Camp 020 during World War 2, served with the Gurkhas the late 1910s and early 1920s. From Stephens' biography on the Frontier Medals site, we know that, on 15 April 1919, he was commissioned into the the 2nd Battalion of the 2nd Gurkha Rifles as a Second Lieutenant. That same bio notes that on 12 June 1920 (after being promoted to Lieutenant), Stephens was detached from his regiment and served as General Staff Officer 3 with the Wana Column until 15 October 1921, and again from 3 November 1921 to 27 December 1921. The Wana Column was a reinforced brigade that was sent to reoccupy the town of Wana (Waziristan - now part of Pakistan) in 1921. Stephens was even Mentioned-in-Dispatches "for distinguished service during the operations in Waziristan (April 1921 to December 1921) (London Gazette - 12 June 1923). Superb photograph album documenting the British reoccupation of Wana and the end of the 1919-20 Waziristan campaign in over 80 intimate original snapshots, supplemented by a run of atmospheric professional photographs from Holmes's souvenir series, "With the Wana Column", and several group officer portraits, all meticulously captioned and forming an exceptionally rich portrayal of British operations in the region which from the First World War to Independence "dominated events on the North West Frontier, politically and military" (National Army Museum, online). His impressive photographs depict the progression of the Wana Column from Jandola, through the Shahur Tangi gorge to Haidiar Kach and Sarwekai camps, thence to Dargai Oba, Rogha Kot, and finally Wana, with photographs of the fort, environs, Wazir hostages, and three group officer portraits; the captions include informative details regarding the landscape, conditions, British engagements with the Wazirs, and indicate the neighbouring stations in each direction en route. Hinton visited the Peter Harrington Gallery in Chelsea and was able to take pictures of some of the well-captioned photographs in the album and discovered that a few included a young Robin Stephens. The lighting in the shop was not great, but Hinton was still able to get some pretty good images. Stephens would have been 21 years old in these photographs. 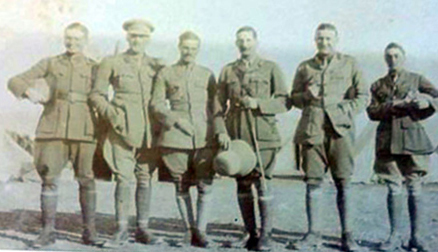 Photograph of officers from the Wana Column circa - Robin W.G. Stephens is at far left. 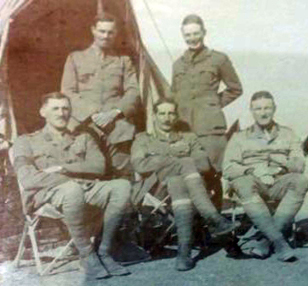 Photograph of officers from the Wana Column circa 1921 - Robin W.G. Stephens is standing at right. These are amazing photographs and I am grateful to Hinton for tracking them down and graciously sharing copies of them. On the other hand, both Hinton and I are still stymied by Stephen's ultimate demise. It is still a mystery.